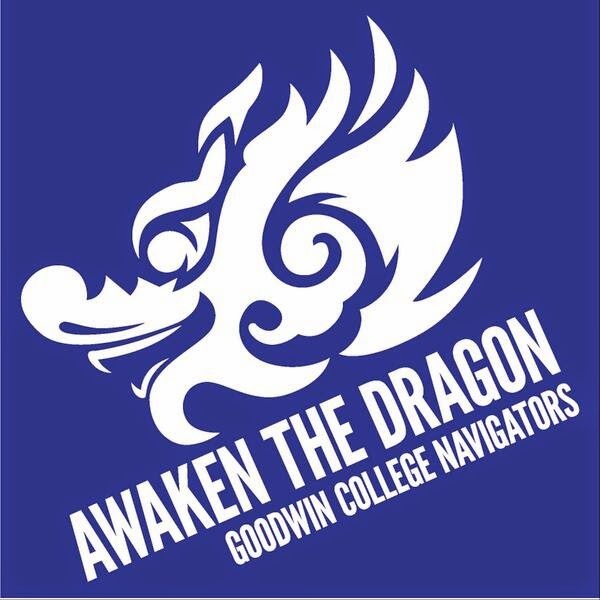 Please email eemet@goodwin.edu if you would like to sign up for this year's Dragon Boat team. The event will last all day on Saturday, August 16, at the base of the Connecticut Science Center. We will also be having at least 3 practices during the week, between July 15th and race weekend. If you are able to commit to the four races on August 16, and a minimum of three practices, we would like you to join us on the Connecticut River, for what will be a great time. No experience required, but knowing how to swim is (the dog-paddle counts). Here's a sample of what to expect. This event is free to students, and signups will close as the boats are filled. Healthy Nutrition - Part One, July 11, 5 to 7 p.m. at East Hartford South End Senior Center; Part Two, July 12, 9 to 11 a.m. at Goodwin. Introduction to Mobile Technology – Part One, August 8, 5 to 7 p.m. at East Hartford South End Senior Center; Part Two, August 9, 9 to 11 a.m. at Goodwin. Please share this information with friends and family members. Registration required. For more information: Claude Mayo, program coordinator, 860-913-2015 or cmayo@goodwin.edu. The bookstore will be closed on Monday, June 30, for inventory and carpet cleaning. No purchases can be made in the store on that day. Those wishing to obtain booklists, pricing, or to make a textbook purchase for Second Module can do so through our textbook website at www.goodwin.bkstr.com and orders will be filled Tuesday, July 1, for pick-up. Financial Aid is an available payment method on our textbook website; if choosing to ship, those costs must be covered by a valid credit card. The last date to register for fully online courses for BIO120, BIO121, CHEM101, BIO211, BIO212, BIO235 is the last Friday before Community Day each semester. No on-campus and/or hybrid section students can switch to fully online after the designated day. A great new service for students! Looking for general information about Goodwin but not sure whom to contact? Email ASK@Goodwin.edu with your question and a Goodwin representative will have an answer or supply a contact for you within 24 hours. WAVE will host two sessions on June 24 in Room 301 at 2:45 and 5 p.m. Open to all students, there will be tips on becoming inspired, learning to de-stress, and techniques for becoming a better you! The College is looking to put a group together to see one of Amma's regional appearances. She'll be appearing on Saturday, June 28th at 10:000 AM, in Marlborough, Massachusetts. Congratulations to Christa and Ashley, the most recent winners of a Goodwin College gift card for sharing their Goodwin story. You could be next. 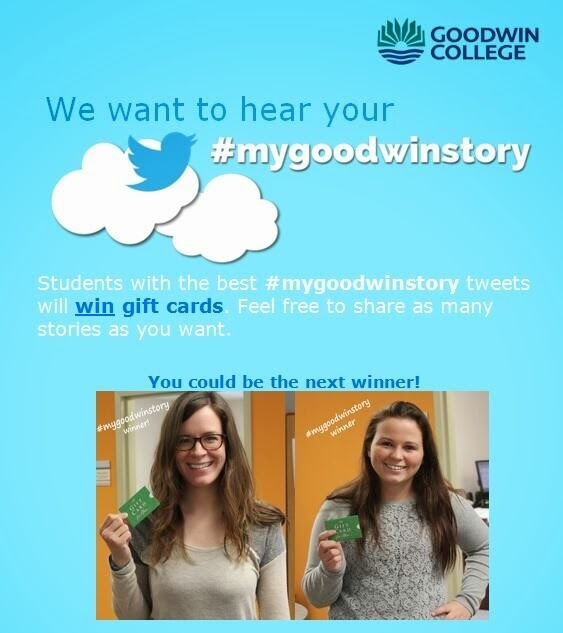 Tweet your story, and be sure to include the hash-tag #mygoodwinstory. More winners will be drawn soon! 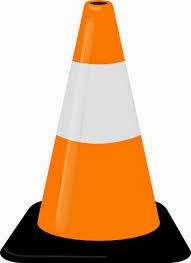 Please note that the section of the Goodwin College parking lot on the south side of the main campus building (on your right as you drive past the main entry way) will be closed for construction activities, Monday, June 16, through Tuesday, July 15. Parking will be available in front of the main building. 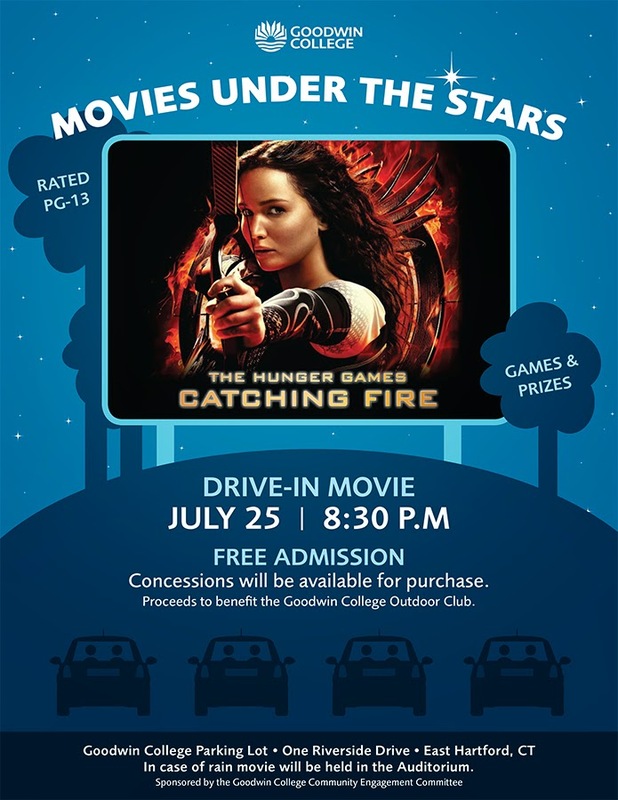 Goodwin College’s popular drive-in series, Movies Under the Stars, continues on Friday, July 25, at 8:30 p.m. with the blockbuster hit The Hunger Games: Catching Fire. A year after winning the Hunger Games, Katniss Everdeen and Peeta Mellark go on the Victor's Tour to all the districts. President Snow warns Katniss to put out the flames of an uprising or everyone she cares about will be in danger. Snow enacts the Quarter Quell, in which previous Hunger Games winners compete again. Rated PG-13, Catching Fire will be shown in the parking lot of the main Goodwin building at One Riverside Drive in East Hartford, admission is free, and the public is welcome. PLEASE NOTE: RAIN LOCATION IS IN THE AUDITORIUM. Concessions will be sold to benefit the Goodwin College Outdoor Club. Please note: the South entrance and corridor, located by the loading dock in the main College building, will be closed for construction from 7 a.m. to 12 p.m. on Saturday, June 14. An essay by Nicole Desjardins, a student in Randy Laist’s ENG 300-01 Advanced Writing class, was recently published in The Connecticut Mirror, an online “nonprofit, nonpartisan news outlet with a very clear mission: to produce deep reporting on government policies and politics, to become an invaluable resource for anyone who lives, works or cares about Connecticut, and to hold our policymakers accountable for their decisions and actions.” Nicole’s essay, “Let’s have state-funded pre-school for all Connecticut children,” originally written for Laist’s class, appeared in the June 6 op-ed section. Please note that there will be no classes held on Saturday, June 7, as Goodwin College celebrates this year's Commencement. The library and the Academic Success Center will be closed that day as well. On Thursday, June 19, Goodwin College will host the 2014 Early Childhood Legislative Debriefing from 8:30 to 11 a.m. in the Auditorium. This is an informative discussion with policymakers, advocates, and the Office of Early Childhood on bills passed in the legislative session. Register at www.haccc.info/events and enter the code Leg61914. Questions: Elena Trueworthy at etrueworthy@haccc.info or 860-241-0411.